Wind Turbines Inspired By The Flippers Of Humpback Whales « Adafruit Industries – Makers, hackers, artists, designers and engineers! Whales have been swimming around the ocean for a long time, and evolution has crafted them into a super-efficient form of life. They are able to dive hundreds of feet below the surface and stay there for hours. They sustain their massive size by feeding animals smaller than the eye can see, and they power their movement with über-efficient fins and a tail. In 2004, scientists at Duke University, West Chester University and the U.S. Naval Academy discovered that the bumps at the front edge of a whale fin greatly increase its efficiency, reducing drag by 32 percent and increasing lift by 8 percent. 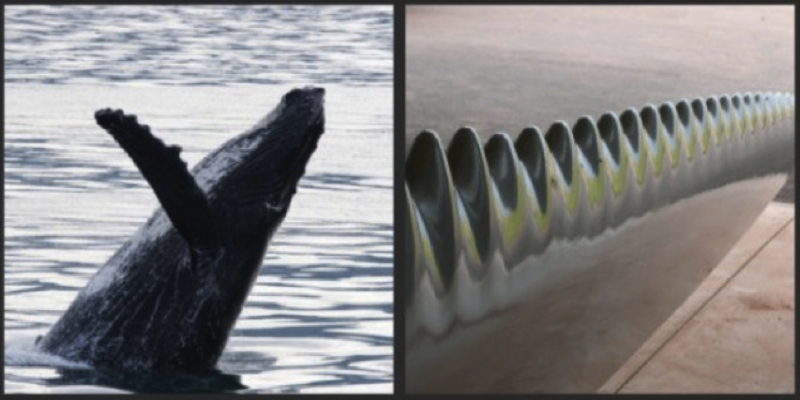 Companies like Whale Power are borrowing this concept and creating wind turbine blades that greatly boost the amount of energy created per turbine. Other companies are applying the idea to cooling fans, airplane wings and propellers.